The Tocal Stock Horse Breeding and Training program is delivered under the AHC30116 Certificate III in Agriculture qualification. It is a one year full-time course designed to give students a wide range of practical farm skills and the underpinning knowledge to begin their career in a variety of horse industries. 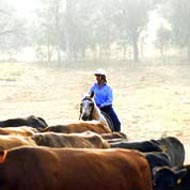 The horse industry is a large employer in the Hunter and other parts of NSW. Jobs include stable hands, strappers, track riders, stationhands, vet assistants, polo grooms, horse breakers/trainers, and stud work for the thoroughbred and pleasure horse industries. Some students continue onto the Certificate IV in Agriculture or undertake further studies in horse husbandry at other institutions. Year 10 or equivalent. Some students may benefit from completion of Year 12. Experience with horses and sound riding ability is required and must be demonstrated during the application process. Case studies: Students learn about horse health, nutrition, breeding, breaking and training, foal and weaner handling, pastures and fencing. Practical work: about half the course involves practical training on College and local horse properties in the Hunter Valley. Farm skills: students learn a range of practical horse, tractor operation and general farm skills to equip them for their first job. Farm safety: an emphasis is given to safe working practices in all areas of farming. Specific units cover WHS, First Aid and chemical use. Tocal College has up-to-date training facilities and equipment. It also has the resources of Tocal's commercial and demonstration farm enterprises including beef, dairy, sheep, horses, poultry and cropping. Tocal runs over 100 stock horses including a group of brood mares which are used to breed replacements. Foals and yearlings are handled by students and students break in and train young horses. Facilities for College horses include horse paddocks and yards, tack room and stables. The College property of 2200 hectares runs up to 1500 beef cattle and all stock work is done with horses. Fees are charged for board and lodging (includes room and all meals), tours, student association fees, equipment and resources used in the course. They also include the Smart and Skilled Student Fee. Fees are payable at the start of each term or by fortnightly installments. There are a large number of scholarships available for students enrolled at Tocal. Application forms are available under Scholarships or the college prospectus. Most students also qualify for Youth Allowance or Abstudy which may cover most fees (contact Centrelink for more information).